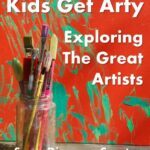 Welcome back to Kids Get Arty – our bi-monthly challenge, where we pick and artist, discuss his work and then have a go at something inspired by that artist. This is the 4th challenge. 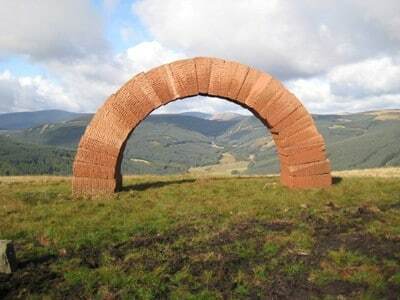 And this time we decided to take a look at British artist, Andy Goldsworthy. Mainly because it is Autumn and I really wanted to make use of the oh so pretty Autumn colours of our leaves. 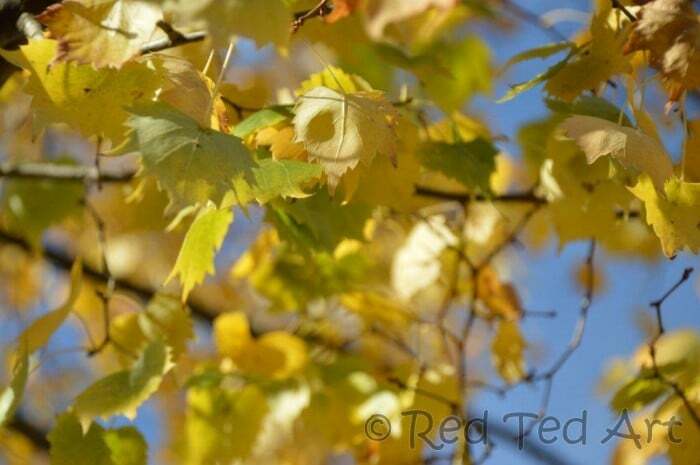 There is an AMAZING read leafed tree at Red Ted’s school and there is a lovely little yellow leaf tree on our road. 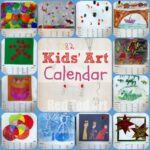 The next Kids Get Arty challenge will be on 16th January 2012. 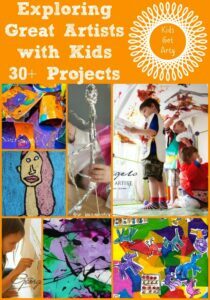 Check out our previous projects, as well as associated linky parties. 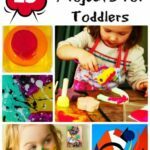 See what we did, as well as all the other FABULOUS projects linked – you will find over a 100 ideas to keep you going. Back to Andy Goldsworthy. 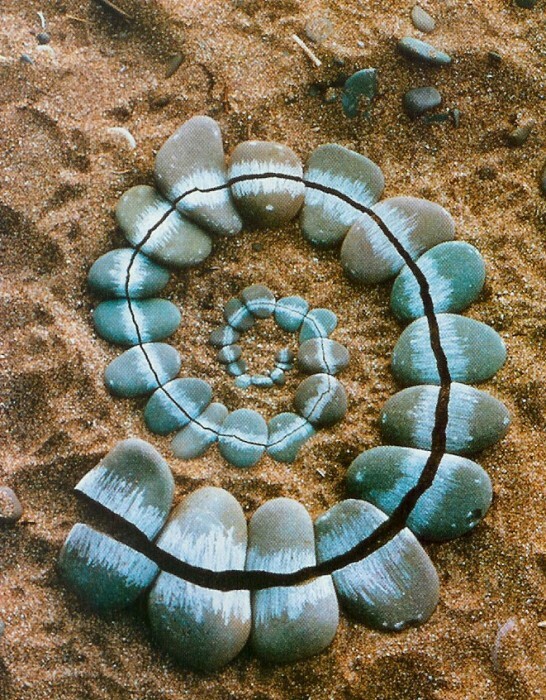 Andy Goldsworthy is a key artists in the “Land Art” movement – creating temporary art by working with nature. 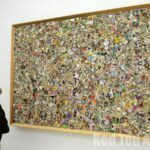 Many of his creations are made solely by using his bare hands, teeth and any “natural” tools that he happens to find. 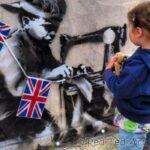 His art is often temporary, so photography plays a key role in his artwork – capturing the art, before it decays, falls apart or floats away. “Broken Stones“, scratched with another pebble. 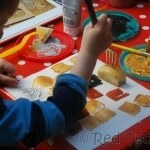 I asked Red Ted what he thought it was made of and how Andy Goldsworth did it. I asked him whether he liked it (yes), how it made him feel and why he thought there was a “hole in the middle”. Red Ted was also fascinated by Goldsworthy’s arches – “Mummy, how did you DO that?” – I tried to explain the science behind it. And think I failed. I think we will have to do a little project on tension at some point (or maybe I can get Science Sparks to do it?!). Red Ted loved the stick structure falling apart. Well, I don’t know about love, but it was fascinating. He also loved the creation of ice structures and should we have a cold winter, it is another thing that I would like to look at with him. 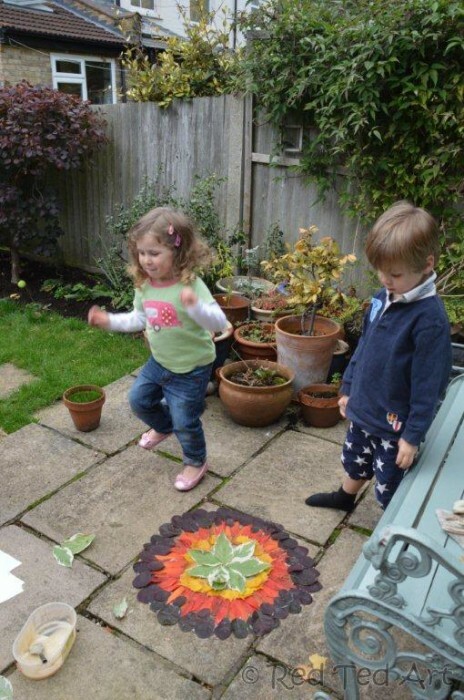 Then we grabbed our leaves and headed to our neighbour’s house (she has a nicer patio). And got creating. We cheated a little. 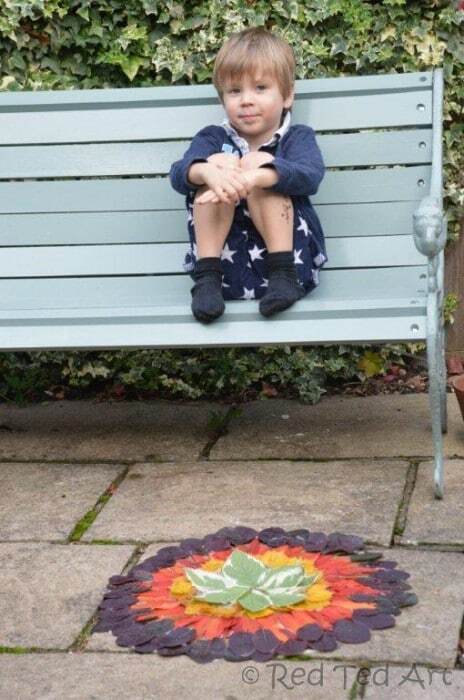 I made some papier mache paste, to help stick the leaves down a little, as I knew with 3 children jumping about and a light wind, we may not get very far. We needed to slow the decaying and destruction process down. 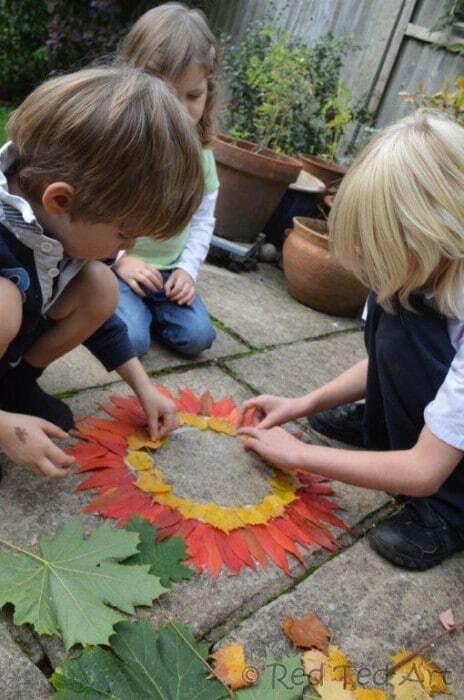 I showed the children all the leaves. And asked them which colour we should start with. 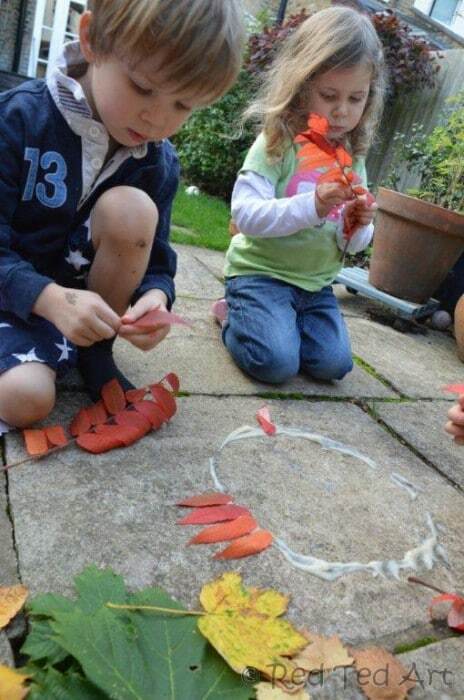 As per Andy Goldsworthy, I put down a circle of paste and the children started adding the red leaves. Red Ted then wanted to add a yellow layer on the inside. Our neighbour’s boy found some purpley leaves in his garden and brought them over. We added them to the outside. 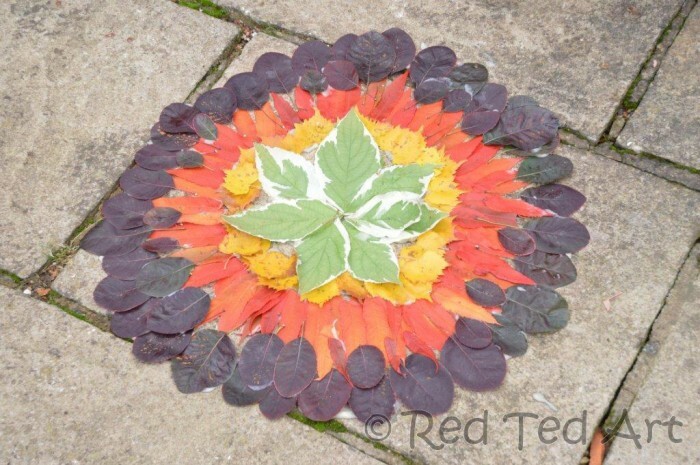 After MUCH debating.. we then all agreed on adding some green leaves in the middle (I wanted to keep it free, but Red Ted wanted to fill it up, so we did). The kids LOVED it. My neighbour LOVED it. Her husband LOVED it. It was just so pretty! Oops, I missed the part about linking a post about a specific artist. How embarrassing?! I came back to delete it, but looks like you’ve taken care of it. I’m more of an illustrator fangirl, rather than artist, as I’m a children’s librarian. 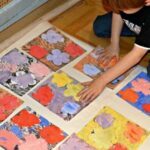 I love the idea of using art with children, though. Hello! I hope that was ok! Only because you can’t delete and we started to focus on the right so of entries. 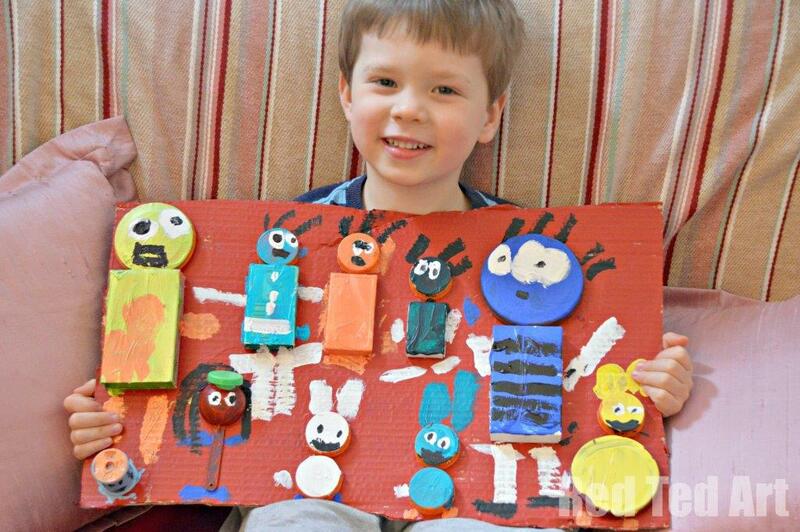 I do love seeing your creativity! 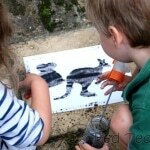 Do come back and link in the normal Kids Crafts – back next week??? Marina – yes, I think we are now starting to get into the “no leaf” season here too.. The floor is covered in yellow and red leaves, but they are getting muddy! Emma – good point, the arch would be perfect for Science Sparks! In fact a lot of Goldsworthy would be great for science sparks!! I am so jealous you have such beautiful leaves!!! I miss my hometown (Chicago) now that we are in Houston, where the leaves don’t change and fall! Awe I know what you mean. We are very lucky! I love that first picture too! I just LOVE this! I know my daughter would think this would be so much fun. I can’t wait to share it with her. Thanks so much for sharing! 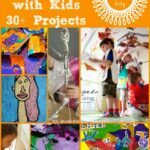 And thanks for linking at For the Kids Fridays! 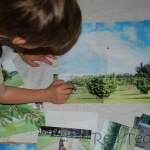 Beautiful,my daughter loves land art,too. Oh that’s beautiful. 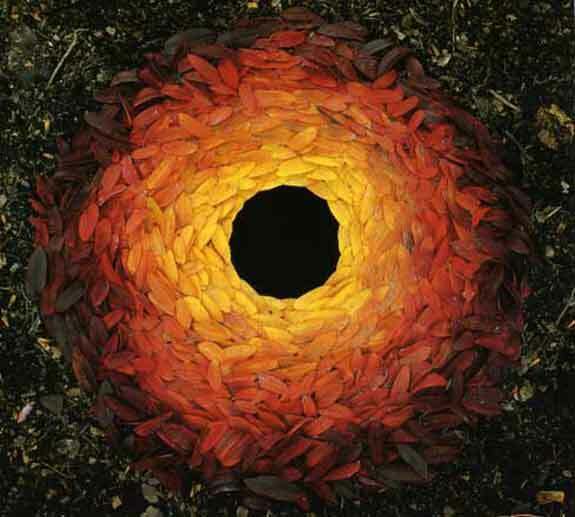 I Love Andy Goldsworthy. Beautiful! I didn’t manage to li up in the end. Not enough time for blogging now hubby has finished his exams. This is so beautiful! I would have never thought that paste was used but it makes sense.